Melukote, also known as Tirunarayanapuram, is about 135 kms from Bangalore, situated on a hill at an altitude of 3,000 feet. It is a peaceful temple town. There are two temples: Main – Lord Tirunarayana, other being Yoga Narasimha on top of an adjoining hill. The main deity or moolavar is Tirunarayana with unique presence of Lakshmi, both in his chest and at feet (Varanandi), in Girbagriha. In the immediate court yard before Girbagriha, to the left side is the shrine of processional deity – Utsavar Shelvapillai – accompanied by Sridevi and Bhudevi. On circambulating, one sees Sudarshana Alwar followed by the consort Yadugiri nayaki’s shrine. Shelvanayaki, consort of utsava moorthy graces the Thayar Sannidhi. Further ahead is Acharya Ramanuja’s Sannidhi. He is the king of Melukote and is popularly known as talking Ramanuja. Melukote was known as Narayanadri in Kritayuga, Vedadri in Tretayuga, Yadavadri in Dwaparayuga. In Kaliyuga, after Ramanuja’s arrival, it came to be known as ‘Yathisaila’. It is important to note that both Tirunarayana the moolavar and Shelvapillai the Utsavar also known as Ramapriya and Sampathkumara, are not man made. These vigrahas are ‘Swayam Vyakta’ – self manifested, which is the supreme form of Archavatara of God. Thus the sanctity of Melukote temple is God divine. his heart with Bhudevi and Sridevi. This idol is called Shelvanarayana. Brahma was happy and started worshiping the new found idol. decided to leave this world. So he gave away this idol to King Kusha. The idol came to be known as ‘Ramapriya’. King Kusha, in turn gave the idol, as marriage gift to Yadavakumara of Yadava dynasty who married his daughter Kanakamalini. Thus the idol Ramapriya changed hands from Suryavamsha to Yadava dynasty. Ultimately, it came to be possessed by Lord Krishna, himself a Yadava, for daily worship by his family. After a long time Balarama and his friends, while on a piligrimage, arrived in Melkote. Looking at Moolavar Tirunarayana Balarama found an identical similarity with Ramapriya – their family idol of worship. Balarama, on return, mentions this similarity to Lord Krishna who does not believe. Later, Lord Krishna and Balarama together come to Melkote to verify. Krishna looks at Tirunarayana and hails that the idol Ramapriya at their home is none other than Tirunarayana. Krishna decides that the right place for Ramapriya is to be with Tirunarayana. 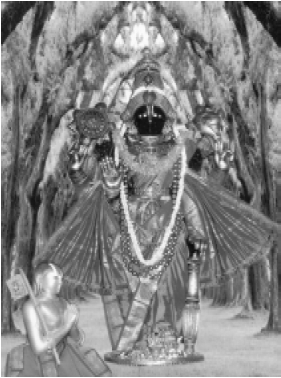 Thus the idol Ramapriya came to be installed in Melukote. Acharya Ramanuja lived for 14 years in Melukote at the end of 11th century. By that period, the idol of Tirunarayana and Ramapriya were found missing. The temple was destroyed and the area had grown into forest, due to poor governance, decline in spiritual fervour, and invasion by Muslims. Ramanuja retrieves the idol of Tirunarayana from an ant hill near Kalyani as guided by Lord Narayana in a dream. Ramanuja reinstalls Moolavar with the vimana. Following this Ramanuja lays down methods of pooja and other temple shastras. He desires to conduct Brahmotsava and other festivities. But he feels worried and disheartened that the temple does not have ‘Utsavamoorthy’. While he was in this state of sorrow, Lord Narayana appears again in a dream and guides Ramanuja to find the missing idol of Ramapriya in a Muslim sultanate. Ramanuja proceeds to the sultanate, finds the idol being used as a playing toy by the princess. He beckons the idol to return with him. The idol follows him. In a ecstatic joy of finding the idol, Ramanuja calls Ramapriya as Sampathkumara. The Muslim princess, who could not bear the separation from the idol, follows Ramanuja all the way to Melukote. Ramanuja reinstalls the idol with Sridevi and Bhudevi, as Utsavamoorthy. This is the same ‘Shelvapillai’ which is taken around in procession, even today, during Utsavas. The muslim princess was not allowed, on arrival at Melukote, to enter the temple premises. She, from the place where she was standing, merges with the Lord and attains her desire of being always with the Lord. She came to be called as ‘Bibi Nachhiyar’. Even today her idol can be found at the feet of the lord. It will not be incorrect, if it is said acceptance of ‘Bibi Nachhiyar’ as part of the shrines in Melukote temple, expresses the secular aspect of Srivaishnavism and the Catholicity of Acharya Ramanuja. It is a diamond crown studded with various precious stones. This adores the head of Shelvanarayana, the Utsavamoorthy, only for a few hours during phalguni day of Brahmotsava, called as Vairamudiutsava. During the remaining part of the year, it is kept in the safe custody of Government authorities. Prahalada’s son Virochana, after stealing the crown which was adoring Lord Narayana in Ksheerabdi, hides it in Paathala. Garuda retrieves the crown. On his way back, Garuda looses speed and suddenly stalls. He looks down and finds Lord Krishna grazing the cows. Garuda senses the message that this crown has to be delivered to Krishna. He descends and surrenders the crown to Lord Krishna, who tries it on the head of their family idol ‘Ramapriya’. It fits exact and perfect. Thus the Vairamudi came to adore Shelvanaraya the Utsavamoorthy, which continues even today. The idol of ‘Narasimha’ was installed by Prahalada himself. The temple is on a hill which is to the east of Kalyani. There are 360 steps to reach the temple. It is interesting to note that Hyderali, ruler of Mysore – when passing through, found a few of his elephants sick and unwell. On the advice of his followers, he prayed to Lord Narasimha for a cure. Lord answered his prayers. Elephants were cured. Hyderali, the muslim king was astonished at this miracle and gifted a ‘Nagari’ – Drum, which is beaten daily during pooja, even today, giving a resonant sound. There are seven sacred centers – Saptha Kshetras and eight Holy waters – Ashta Thirtha. These have their own Mythology. These are sacred and visits to these Kshetras and Thirtas are said to remove sins and guide the souls to Moksha. Melukote temple has Utsavas every month. It is always a scene of grandeur. Cheluvanarayana, during utsavas comes close to all homes and makes people very happy with his darshan. Angamani utsava, Rathasapthami, Punarvasu utsava, Vairamudi Brahmotsava, Krishnarajamudi utsava, Rajamudiutsava, Pavitrotsava, Pallavotsava, Navaratri utsava, Krithrikotsava etc are main stays of Melukote temple. These are literally social and cultural aspects of a Vaishnavas life. The other holy and great festival is Acharya Ramanuja’s Tirunakshatram. Ramanuja and Melukote are inter twined. Srivaishnavas are part of this divine combine. A visit to Melukote is a prostration of ‘Sharanagati’ or complete ‘Surrender’ to Lord Tirunarayana and Acharya Ramanuja.